Estancia Santa Rosa and its sister lodge El Rincon are both located in Entre Rios Province, in low lying farming and cattle raising land between the Uruguay and Parana rivers. Santa Rosa is the refurbished/remodeled headquarters of a working racehorse farm that happens to be within 30 minutes of huge populations of ducks, doves and perdiz. The lodge has eight bedrooms with seven baths, and offers impeccable organization, experienced guides, attentive service and excellent cuisine, wines and bar. Santa Rosa offers the world’s best duck hunting, true high-volume dove shooting and excellent perdiz hunting over quality bird dogs. The adjacent huge marshes and pothole systems around Santa Rosa offer three different water levels, thus ensuring that at any given time conditions are ideal in one area or another—sometimes all three habitats are ideal at the same time. This area has a wintertime population of ducks literally in the millions and relatively little hunting pressure. River Plate legally feeds from 150-200 blinds EVERY DAY before and during the May through mid-August season. At Santa Rosa, a good number of the shoots take place right on the same ranch as the accommodations. Limits are quite liberal. Entre Rios is a province that is rich in cereal grains. Vast cultivation of corn, wheat, and sorghum has caused a huge surge in the dove population, which certainly numbers in the tens of millions. You will be astounded at the clouds of doves exiting and returning to the roost at all angles. This is true super-high-volume dove shooting, in the same class as Cordoba or Salta. Our guests routinely expend 25-40 boxes of shells in an afternoon shoot. Virtually all of the shooting areas are within 30 minutes of the lodge. Following a well-trained Brittany or English setter over rolling pasture land, watching the dog work out the scent of a moving perdiz is a classic upland experience. Hunters can expect to shoot a limit of 10 perdiz each in 1-2 hours, enjoying the fast take-off and swift flight of these beautiful gamebirds. 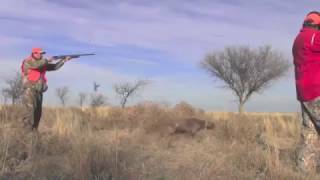 Hunting generally takes place within a twenty to thirty minute drive from the estancia. River Plate’s well-mannered dogs and the beautiful countryside will ease you into surroundings reminiscent of days gone by. As you walk across the gentle landscape, frequent and explosive flushes will get your heart pumping with excitement. Santa Rosa is a remodeled/refurbished ranch headquarters with eight bedrooms and seven baths. The living and dining areas are comfortable and cozy and the personal service is amazing—for example a uniformed maid meets you right at the door upon arrival from the duck hunt and removes and immediately cleans your waders. Your energetic host, Ignacio “Nacho” Pradal, will see to your every hunting and dining request! Buenos Aires is best reached from Miami, Atlanta, Dallas/Fort Worth or Houston on American Airlines, United Airlines, LATAM, Aerolineas Argentinas or Delta Airlines. Guests are met upon arrival in Buenos Aires and transferred via private vehicle three hours to the estancia.